How To Get Free Ethereum in 2019? Once you learn that investing in Ethereum requires some sweat and brains, you may start wondering if it is possible to actually earn free Ethereum (ETH) and collect it without any effort or investment. Now, knowing that there is no such thing as free lunch or a money tree, wanting to learn how to get free Ethereum may seem like a waste of time. Well, not exactly, but you can surely spend your time better than looking for ways to earn free ETH and buy a pie in the sky in the process. So How Can You Earn Free Ethereum? If you would love to get your hands on Ethereum without enough money to invest in mining or buying it, you can try visiting websites on which Ethereum is, theoretically, flowing for free. These are called Ethereum faucets, and they offer rewards in the form of tiny amounts of ETH in exchange for completing captchas or interacting with numerous ads. The amount of ETH you will receive at the end of the day is actually too small to make a difference, even if you decide to go through repetitive mini tasks and aggressive ads. Many of these sites also have a minimum amount of Ether you need to “earn” before you actually receive it. A constantly renewed ETH faucet list can be found here. Some of these sites ask you to turn off your ad blocking software and pose high cash out limits, so be careful when investing your time and resources. 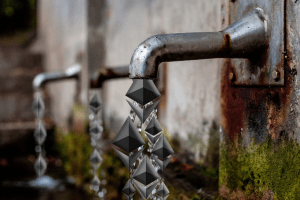 Are Ethereum Faucets Worth It? The only real winners in the faucet game are the ones who run them, and even they probably don’t make much money off it. Speaking of you, you wouldn’t make much either. Even if you stumbled into a legit faucet with immense rewards, you’d probably still make up to $1 an hour at most. Besides, if you still insist on finding out how to get Ethereum without any work or investment, beware that you may expose yourself to various hackers and scammers. These can send you offers, claiming that they will give you ETH for free, or in exchange for laughably small amounts of other currencies. Do not fall for it, but rather expose the scammers on social networks and warn your friends. Even if you find Ethereum faucet sites which are legit, the amount of time you would spend on learning how to get free Ethereum is surely better spent on studying realistic methods to earn ETH using conventional methods. Mine Ethereum. Of course, mining comes with initial costs, however, it’s still the most legit way to earn Ethereum. It’s not free but has way more potential for significant returns. Get a cloud mining contract. Alternatively, you can buy a cloud mining contract and rent mining gear in one of the Ethereum mining rigs. You’ll receive your share of the rewards in your wallet but know your breakeven period before putting your signature on a deal. Buy Ether. The simplest way to obtain a substantial amount of Ether is simply to buy it in one of the exchanges. Some of the best exchanges to start your trading career are Coinbase, Kraken, and Bitstamp. There you can purchase ETH with Dollars (USD) or Euros (EUR). Besides, you can check our Price Tracker to find the best price to buy/sell ETH. Work for Ether. You can unleash your talents for Ether. Whether you’re good at writing, design or accounting, working for Ether isn’t unorthodox. See websites like Cryptojoblist.com or Crypto.jobs to find out whether there are job openings for you. It’s pretty clear that almost any other job would generate you more than $0.5-1 per hour without exposing you to extra risks. Of course, some apps and games might be fun, but from an investment standpoint, there are far better alternatives. And remember that nothing ever comes for free!